WordPress is a popular open source content management system (CMS) that can be used to easily set up a blog. It is a very flexible system, through its plugin and template support, that allows users to extend its functionality to meet their specific needs; WordPress can be customized to support anything from a basic blog to a fully-featured eCommerce site. In this tutorial, we will show you how to set up WordPress with an Apache web server on FreeBSD 10.1. Before you begin this guide, you must have a FAMP (FreeBSD, Apache, MySQL, and PHP) stack server setup. This WordPress installation tutorial is based on this FAMP tutorial: How To Install an Apache, MySQL, and PHP (FAMP) Stack on FreeBSD 10.1. 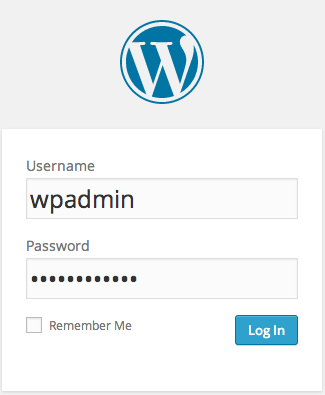 This tutorial assumes that you want to serve WordPress from the root of your web site, e.g. http://example.com/, and that your Apache document root is empty (aside from the default index.html file). If you do not already have a FAMP setup, follow the linked guide before continuing with this tutorial. Note that this tutorial, like the linked FAMP guide, uses PHP 5.6. Although you already have PHP 5.6 installed, WordPress requires additional PHP modules in order to function properly. We will use pkg to install these required PHP modules. Each of these modules allows WordPress to use various functions in order to perform certain tasks. For example, php56-gd provides libraries for image handling, and php56-curl allows WordPress to download files from external servers for tasks such as plugin updates. Also note that if you followed the prerequisite FAMP tutorial, you should have already installed php56-mysql, which allows WordPress to interact with a MySQL database. WordPress uses a relational database, such as MySQL, to manage and store site and user information. In this step, we will prepare a MySQL database and user for WordPress to use. You will be prompted for the password that you set for the MySQL root account when you first installed MySQL. After providing the password, you will enter the MySQL command prompt. Note that every MySQL statement must end in a semi-colon (;) before it will execute. 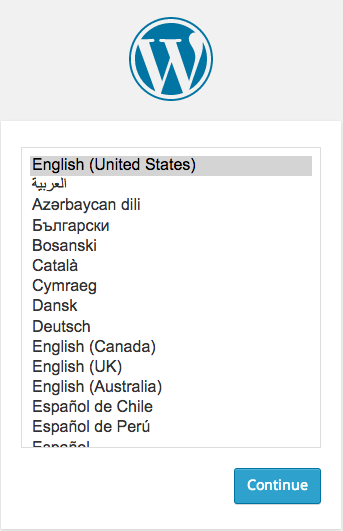 The MySQL database and user are now ready for use with a new WordPress installation. Let's download WordPress now. Now we must download the WordPress files from the project's website. This extracts the contents of the archive to a directory called wordpress, in your home directory. Before making WordPress accessible via our web server, we must configure it so that it will able to connect to the database that we created earlier. Now that your WordPress application is configured to connect to your database, we must copy it to Apache's DocumentRoot directory, where it can be served to your site's visitors. If you followed the prerequisite FAMP tutorial, Apache's document root will be located at /usr/local/www/apache24/data—if your document root is located somewhere else, be sure to update the highlighted path in the commands in this section. Now that the WordPress files are being served by Apache, you are almost ready to start using WordPress. The next step is to run the WordPress installation script. 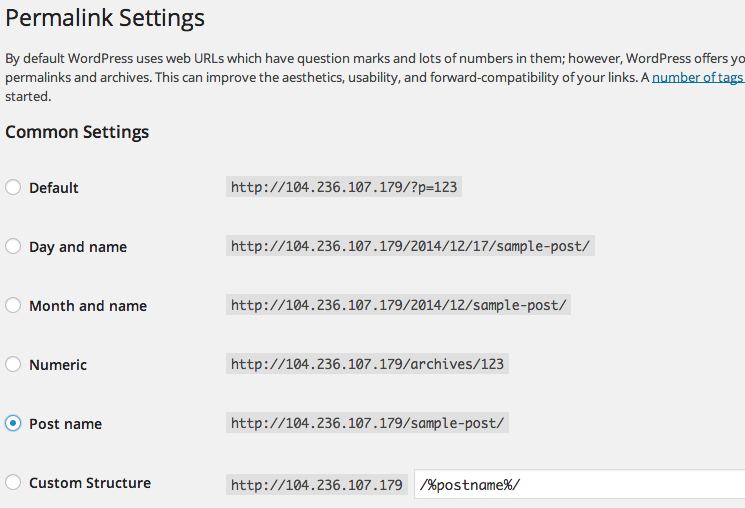 The script will ask you a few questions about your WordPress site, then initialize the database. Fill out the site information. Once you are finished, click the Install WordPress button. Congratulations! Your WordPress site is up and running. Continue reading if you want to set up pretty permalinks. To change your permalink settings, we must reconfigure Apache then our WordPress settings. First, we need to enable the Apache rewrite module. Now, we need to modify the Apache configuration to allow WordPress the ability to perform .htaccess overrides. Now Apache is configured to allow URL rewrites but we must create an .htaccess file that WordPress will use to reconfigure the permalink settings. Now that Apache is configured to allow rewrites through .htaccess files, we need to create the actual file that WordPress will write its permalink rules to. 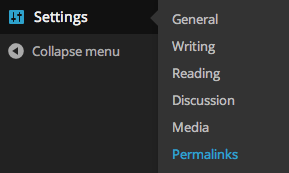 Now we can use the WordPress dashboard to reconfigure the permalink settings. When you have made your selection, click the Save Changes button at the bottom of the page. This will generate the rewrite rules, and write them to the .htaccess file that you created earlier. Your new permalink settings should be working now. Test it out by visiting one of your posts, and observing the URL. 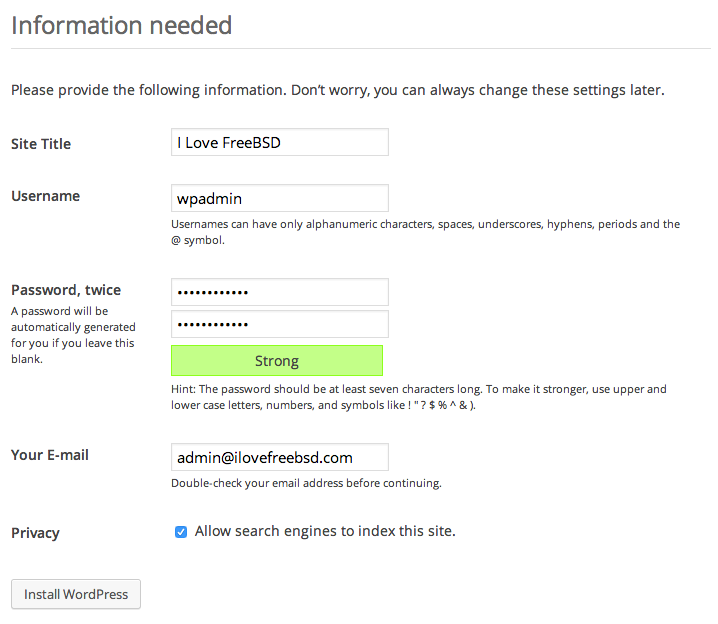 You should now have a WordPress instance with Apache up and running on your FreeBSD 10.1 cloud server.